Born into an Hasidic Jewish family in Vitebsk (in present-day Belarus), Marc Chagall (1887-1985) studied art in St. Petersburg, Russia before moving to Paris, where he lived from 1910 to 1914. During his time in Paris, Chagall absorbed the influences of Symbolism, Fauvism and Cubism and combined them with his own childhood memories of Jewish shtetl life and mysticism to create dreamy, fantastic images that defied artistic conventions regarding space and perspective. Chagall returned to Russia in 1914 and, as a supporter of the October Revolution, in 1917 he was appointed Commissar for Fine Arts in Vitebsk. He returned to Paris in 1923 and became a French citizen in 1937. As a Jew and an artist whose work was ridiculed by the Nazis, Chagall found it necessary to leave Vichy France and he found safe haven in the United States between 1941-48. Although best known as a painter, working in oils, watercolors and gouaches, Chagall has also produced ceramics, stained glass and, as seen in this work, mosaics. 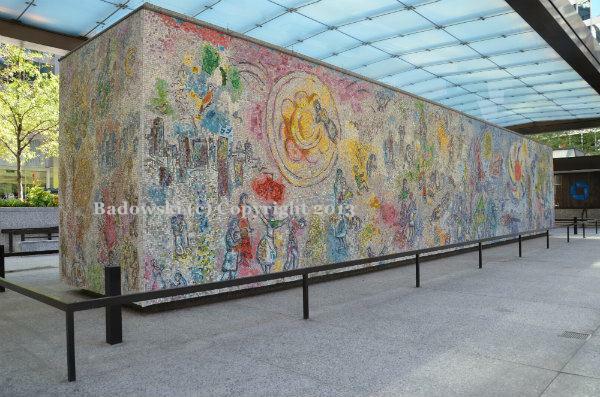 Regarding the title of this piece, Chagall explained, “In my mind, the four seasons represent human life, both physical and spiritual, at its different stages.” Using a model created by Chagall in his studio in France, a skilled mosaicist was sent to Chicago to install the 128 separate panels, featuring 250 different colors, and then join them together with additional glass and stone fragments. The finished piece is 14 feet high, 10 feet wide and 70 feet long. Imagery includes symbols associated with his earlier works, including birds, fish, flowers, suns and lovers, all references to memories of simple, village life, interspersed with sunbursts and city skylines. Chagall’s signature “floating” figures and the absence of a consistent ground line contribute to the otherworldliness of the scenes even as they refer to quotidian activities associated with rural and urban life. As is the case with “the Picasso,” viewers already familiar with the artists’ earlier works are able to recognize each as typical of their style, even if the scale and materials have changed. Chagall arrived 2 weeks before the unveiling and realized that he needed to make adjustments to the areas featuring the Chicago skyline, as he had based them upon his memory of the city from 30 years before! The work was presented as a gift to the city of Chicago on September 27, 1974 and the protective glass canopy was added after renovations in the mid-1990s. Another major work by Chagall, the America Windows from 1977, is housed at the Art Institute of Chicago and were made in commemoration of the Bicentennial and as a reflection of Chagall’s gratitude for the safety and religious tolerance that he found during his stay in the U.S. during the 1940s.